March 28, 2018, 9:30 PM · There’s a wonderful moment in Pretty Woman when Richard Gere takes Julia Roberts to her first opera performance. As they exit his penthouse and enter the elevator, both dressed to the nines, she shyly says, “If I forget to tell you later, I had a really good time tonight.” This line came to mind as I was heading to hear Johnny Gandelsman perform at Big Ears last Saturday. Granted, I was not transported via limo and private jet; rather, my 2009 Hyundai. I wasn’t headed to San Francisco; rather, downtown Knoxville. I wasn’t going to hear La Traviata; rather, the entire collection of Bach’s Sonatas and Partitas for solo violin. And Richard Gere wasn’t with me; alas, alone again. But I felt like Julia must have felt. I knew I was going to have a wonderful evening and hear a life-altering performance. And, in fact, I did. The concert was held in Knoxville’s stunning St. John’s Cathedral. In a dramatic departure from most classical concerts I attend, I was not the youngest person in the audience. (This is noteworthy because I am age 61.) How refreshing to see the church filled with people of all ages (mostly young), dressed in all manner of clothing (mostly black), all wearing trendy ribbon wristbands (the mode of entry du jour). This was not your average concert audience. Then again, this was Big Ears, a festival dubbed as an “international cultural gathering that explores connections between musicians and artists, crossing all musical genres.” A bold enterprise that has garnered national attention. Johnny Gandelsman performing at St. John's Cathedral in Knoxville. Photo by Richard Brooks. Mr. Gandelsman (herein after referred to simply as “Johnny”) states in his bio that he has a “strong desire to break down barriers between artists and their audiences.” Mission accomplished! Johnny entered the chancel area of the sanctuary without ceremony, donned in a long-sleeved black t-shirt, jeans, and high-tops. Particularly striking was his mane of Botticelli-esque golden curls. And he has enough of them to share the wealth with at least 20 people. His beard is long and full, so basically his expressive eyes are the only visible part of his face. He greeted the audience with a subdued, “Hi, I’m Johnny,” which set the tone for the two-plus hours that were to follow. His low-key greeting made it clear that the evening was about Bach, not Johnny Gandelsman. He was simply the delivery mechanism. And, boy, did he deliver. Although we were in a stately cathedral, Johnny came across more like a fiddler in the corner of a barn than a concert violinist. And I mean that in a good way! These pieces are monumentally difficult and require the highest level of technical ability. Because of those facts, we often lose sight of their form… they are, for the most part, dance pieces. Yes, even the much revered Chaconne. Johnny performed them with a lightness and flexibility that made the audience want to tap their toes and get up and move. (Look no further to find the roots of country fiddlin’ and bluegrass.) His tempi in a few movements were faster than I was used to, yet completely convincing. He did not show off, rather, set a pace that truly seemed dance-like. Did he use music? No, he did not! All by memory, and, from what I could tell, not one slip. Did he use vibrato? Yes, he did! But, sparingly. Johnny’s vibrato was minimal, but effective. Somehow the tone never sounded straight or whiney. Open strings were seamlessly integrated into the overall sound… glimmering jewels that didn’t pop out harshly, as they are apt to do when heavier vibrato is employed. Anyone who has studied violin is familiar with the monumental “Chaconne” (Partita No. 2, D minor) and understands its weight in the repertoire. Prior to the opening D minor triad, I was braced for an aggressive “crunch,” but heard instead something much more prayer-like and reflective. (In fact, I think Johnny started up bow!) Rather than overplaying it based on the elevated way we tend to perceive the piece, he gave it no more or less significance than any other movement in the collection. It remained a dance, not a somber dirge. It did not jar the listener from the totality of the musical arc. It was perfection. 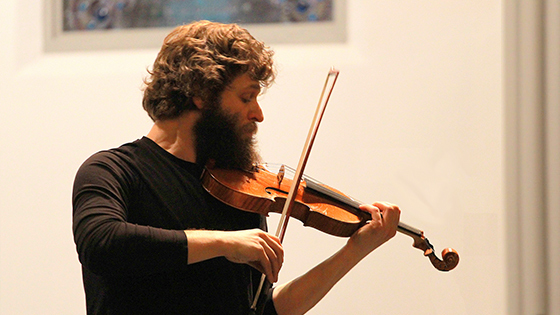 Johnny Gandelsman plays Bach at Big Ears. Photo by Richard Brooks. One of the Chaconne’s variations (starting around bar 65) involves florid 32nd notes, broken briefly by 16th notes. There is a wonderful Yiddish term, davening, which almost defies translation, but musically to me the term evokes the melismatic wails of the cantors of yore. To my ears, Johnny was davening at this point in the Chaconne. Bar lines were blurred and the passage became an overall entreaty to a higher power. But Johnny never went over the top. In fact, it was the Fuga in Sonata No. 3 (C major) when Johnny delivered the true fireworks. Remember that exercise in composition class when you had to circle the “important” notes in a fugue to make sure they weren’t overpowered by the secondary tones? Johnny was definitely in class that day! I was looking right at him, but couldn’t believe my eyes or ears. He had the ability to seemingly play at two dynamic levels simultaneously. The ear (and mind) followed the melodic train, while he would literally “hint” at the harmony through the most subtle and gracious inference of another note within the chord. It was remarkable. I felt as if I were sitting within arms’ length of a magician and still couldn’t figure out from whence the dove emerged! One of my favorite moments came when Johnny started Sonata No. 2 (A minor). He played the opening four-part chord, then shook his head slightly and said, “I’m going to start again.” The chord sounded fine to me. But I admired him for feeling comfortable enough with the setting and his audience to know that he could regroup, for whatever reason he might have had. In a poignant moment, Johnny mentioned that he noticed on social media there was a March for Our Lives in Knoxville earlier that day, a version of the national march taking place in D.C. against gun violence in schools. He said his playing schedule had not allowed him to participate, which saddened him as he wanted to do something. He realized one thing he could do was to donate the proceeds of any CD sales following his concert that evening. In keeping with his overall demeanor, his brief remarks were heartfelt, moving, and appropriate. Humility is a quality that I admire and find to be in short supply. Johnny, however, possesses it in abundance. And what better place to be humble than in the presence of Bach. Yes, Bach was an undisputed genius. On reading John Elliot Gardiner’s remarkable book “Bach: In the Castle of Heaven,” it became evident that even more remarkable than Bach’s genius was his work ethic. Johnny seemed to channel Bach’s single-minded purpose. It is not known whether the Sonatas and Partitas were performed during Bach’s lifetime. A highly-skilled violinist himself, Bach seemed to be exploring the capabilities of this simple wooden box with strings. Johnny did the same. He seemed to be composing as he played. Making it up as he went along. “Ah, there’s a nice chord I can interject!” The result was music that seemed completely spontaneous and authentic. March 29, 2018 at 07:37 PM · Oh how I wish I could have been at that concert! As I read this I thought about how the beauty of the Great Smokey Mountains paired with Johnny's virtuosity. And yes, talent is also so much about the artist's demeanor in addition to his music. As you said: "His low-key greeting made it clear that the evening was about Bach, not Johnny Gandelsman. He was simply the delivery mechanism." That sums it up. As a stage manager for opera companies (including Knoxville Opera) it's such a pleasure when I work with singers who are like that. It's what we do - it's not about us, it's about music. We make music, period. I remember in your previous article you wondered if you were up to the task of sitting through the whole concert. Well, sounds like he made it easy for you! March 29, 2018 at 09:22 PM · WOW! What a beautifully written article!!! Sorry that we could not be there but you make come alive. Thank you for your sensitivity and willingness to share the experience. March 30, 2018 at 03:49 AM · Thank you for summing up the sheer joy you felt in listening to great music played by an expressive, sincere artist. In a world where it seems that everyone is taking sides about which interpretation is “best”, you present a portait of the listener being swept away by the power and emotion of the music. In a perfect world, print and online publications would give the space to superb writers like Ms. Skinner to share, explain, and explore great performances such as this one by Johnny Gandelsman. Even those who read her article without a knowledge of Bach and classical music concerts should be enthralled by the vivid descriptions, background information, and the visceral pleasure of this LIVE MUSIC experience. Congratulations to Ashley Capp's Big Ears Festival for the courage to provide such an experience to its Knoxville audience, and congratulations to Violinist.com for giving Diana Skinner a platform to enthusiastically express her passions. We are most grateful. March 30, 2018 at 10:40 PM · I appreciate the wonderfully positive comments! This online community that Laurie has created is a terrific forum for sharing ideas and inspiration. And I sincerely hope that anyone who reads this article has the opportunity to hear Johnny perform live. And to attend Big Ears next year! March 31, 2018 at 12:02 PM · Sorry I missed it, but enjoyed reliving it through your eyes and ears! Enjoyable article and now I am off to YouTube for a “Johnny” tutorial! March 31, 2018 at 05:20 PM · Well written article. I wish I had been there - but only if Diana was there to explain it to me. April 1, 2018 at 07:38 AM · Thanks, Diana, for writing such a terrific review. April 1, 2018 at 12:34 PM · Jason, You are most welcome! I wish you success on the goal you stated in your bio! It is a lofty one, but I have no doubt you will accomplish it! April 2, 2018 at 05:19 AM · Thank you so much for this wonderful review. You made me wish that I had been at the concert. Your descriptions of Gamdelman's personal style, his approach to the music and his audience, the highlights (for you) of his performance, your answers to the four questions (which I would have asked), and your coda about Bach were all superb! I look forward to reading more from you in the future. April 2, 2018 at 05:16 PM · Although this review makes me regret not having been able actually to attend the concert, the vivid and inspired description gave me a happy sense of participation. In particular, the recounting of Mr. Gandelsman's performance of Sonata No. 2 (A minor) reminded me of the time I was lucky enough, as a teenager, to see Andres Segovia in concert. Part way through one piece, which had sounded flawless to me, he stopped, looked up and then said, simply, "I begin again." The applause, when he finished, was thunderous. April 4, 2018 at 10:35 PM · What a wonderful description of a wonderful concert!!! Wish I had been there. Thanks for bringing it to life for me. April 5, 2018 at 01:31 AM · Thank you so much for the wonderful comments. It was indeed a night I will always remember. Love the Segovia memory! Perfect!